I'm off to Nepal for a month and won't be reporting on Chicago restaurants for a while. Please follow my updates if you're curious at my other blog 2010. Eat well until I return, can't wait to see what's new! One of my last meals in town before my big trip was at The Bristol, and we couldn't have picked a better spot. I am very cautious about giving out 5/5s, but this qualified. The meal was a catch up with friends Geoff and Ashley, and since they live in the neighborhood The Bristol was an easy choice. I really liked the feeling when you entered the room. It's relatively small, but the brick walls and chalkboard gives you a local and friendly feeling. Our server and service all night was first rate, supplying us with detailed explanations and suggestions on request. Even though there is a high demand for tables, we were never rushed through our meal and casually dined for a solid two hours. The menu is approachable and not overly complex. There are 3 distinct sections, with the majority in the starter section, 4 choices of pasta, and 5 choices for large plates. Over half of the selections are "daily specials" and I image the menu has high turnover. Our only suggestion would be to reduce the number of starters and increase the number or large plates. 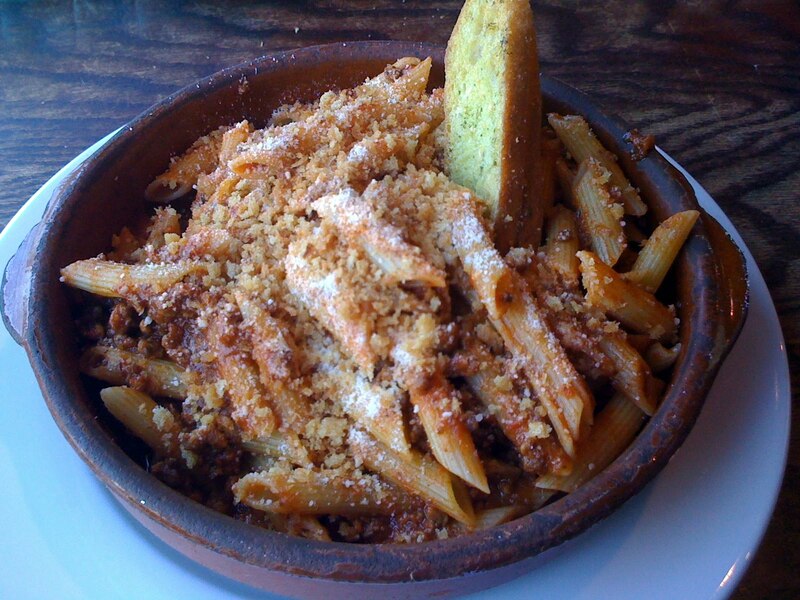 Pricing is very reasonable with starters ranging from $4-$12, $14 pastas and entrees $18-21. Our entire bill for 4 people with drinks and dessert was around $150; great value in my opinion. All of this praise and I haven't even mentioned the food yet. We ordered 3 starters, 4 entrees, 2 desserts and cocktails. Everything was delicious and it was obvious to taste the effort and precision that went into each dish. I'm linking/copying right from Zagat Buzz. 3 places worth going to for the "greatest two minutes in sports." I wish I was in the country to watch, don't forget to bet the Win on your favorite horse. On May 1, celebrate the greatest two minutes in sports, aka the Kentucky Derby, at these local spots. Bucktown’s The Southern will be offering a few specialty Woodford Reserve bourbon cocktails, such as the Lily (a lemonade, bourbon and cranberry juice concoction) and the Lazy Boy (made with bourbon, bitters and soda). Classic mint juleps and peach tea will also be available, and all drinks cost $7. If you’re feeling hungry, order Kentucky’s famous Hot Brown, an open-face sandwich piled high with turkey, bacon and avocado, smothered in Mornay sauce and served with a mixed greens salad for $12 (3–6 PM; 773-342-1840). Everyone’s a winner at the Gold Coast American LuxBar. Attendees who fill out a race card and choose the winning horse will get a $25 gift certificate, while those with losing cards will receive $5 off their next visit. There will also be $5 Maker’s mint juleps, as well as a contest to see who has the best Derby hat, with the winner taking home a $250 cocktail voucher (3:30–5:30 PM; 312-642-3400). Starting at 9 AM Derby Day, Stretch Run will be offering $6 mint juleps, $5 Cosmos, $3.50 Miller Lite bottles and $4 Coors Light and Miller Lite 20-oz drafts. From 10 AM–6 PM there will be a VIP party on the second floor for $75, while general admission to the first floor costs $5. Come the day before and place an advance wager on the race, and be automatically entered into a special raffle (entry on Friday costs $2, 312-644-4477). Alinea rises to 7th on World's 50 Best Restaurants list; top-ranked in U.S. Thanks to Chicago Tribune's The Stew blog. I couldn't think of a better way to spread the news. Alinea is the seventh-best restaurant in the world. Better still, it's the best restaurant in America. In Europe, hands are wringing and ink is flowing over the news that Spain's El Bulli has been supplanted by Denmark's Noma as number one on Restaurant Magazine's annual World's 50 Best Restaurants list, announced Monday night in London. In Chicago, corks are popping on Halsted Street because Alinea, now seventh in the world (it was number 10 last year), is the highest-ranked restaurant in the United States. Actually, the highest-ranked restaurant in North America. "We're very happy. Ecstatic," says Nick Kokonas, partner at Alinea with chef Grant Achatz. "It's always a fun list, and always nice to be moving in the right direction. All good stuff." Alinea made its debut on the World's 50 Best list in 2007, when it was ranked 38th in the world. It moved up to 21st in 2008 and 10th in 2009. Other U.S. restaurants on the list include Daniel (8), Le Bernardin (15), Momofuku Ssam Bar (26), French Laundry (32), wd-50 (45) and Eleven Madison Park (50). All are in New York City except for French Laundry, which is in Yountville, Calif. Conspicuous by its absence, perhaps, is Charlie Trotter's, a mainstay among the 50 Best from 2002 (the list's inaugural year) through 2008. Trotter's fell out of the top 50 in 2009 and was passed over yet again this year. Those considering a cuisine-based vacation might look to Spain, which placed four restaurants (El Bulli, El Celler de Can Roca, Mugaritz and Arzak) in the top 10. Thomas Keller's French Laundry, where Achatz once served as sous chef and which was ranked number one on the Best 50 list in 2003 and 2004, tumbled to 32d place, 20 places lower than last year. Keller's other restaurant, Per Se, remained in the top 10. But the big surprise was that El Bulli, the top-ranked restaurant for four consecutive years, was knocked off its perch, falling to second place. El Bulli owner Ferran Adria announced that he would close his restaurant permanently at the end of 2011, but that announcement took place well after voting took place. Fat Duck, in Bray, England, the second-ranked restaurant for the last four years, dropped to third. Kokonas, for one, was pleased to learn that Noma, which was third on the World's 50 Best list last year, leapfrogged to first place. "Rene (Redzapi, Noma's executive chef) is probably one of the nicest guys you'll ever meet," he said. "So that's a bonus." Erica and I joined Mr. Levin for a Sunday night dinner at Happ Inn. I had read good things about Happ Inn and how "Happy" people were eating there. We all agreed the meal was good with simple tasty food. The concept also works very well for the area and is very family friendly. If the goal is a family spot serving simple American fare at reasonable prices, they succeeded. However, our experience went downhill as time passed when we realized how poor the service was, how much we didn't like our server (we were served a different year of wine than what is listed on the menu) and that the dessert wasn't that great. The meal was always trending between a 3 and 4 out of 5, but by the time we left is was a solid 3. 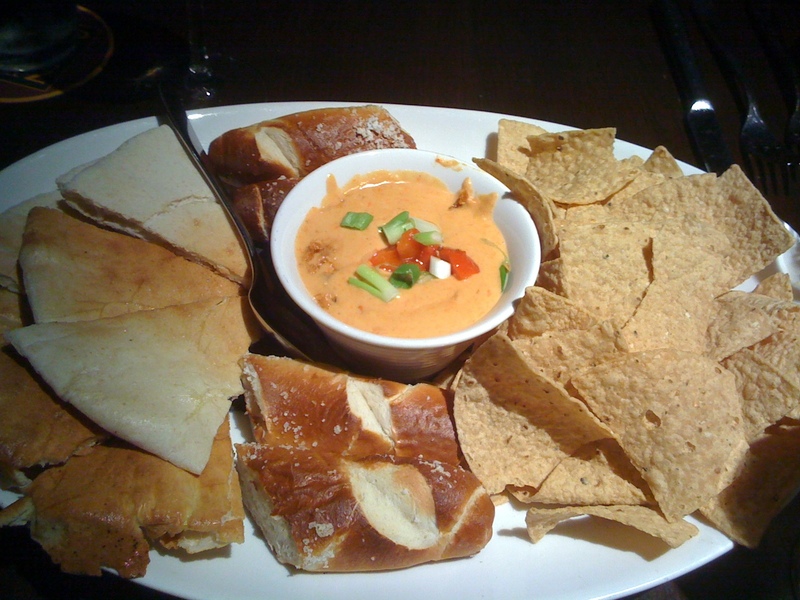 We started with the Queso fun-dido, a melted cheese cup with various bread products for dipping (tortilla chips, pita and pretzels). The cheese was warm and smokey, and lacked a little salt. But the breads were great and provided the extra flavor for a nice starter. I went to a Tilted Kilt for the first time last week to celebrate a bachelor evening. I was unaware of this national chain of restaurants and left very impressed with the operation. Obviously most people will comment on the theme and the attire of the servers, but the overall concept of a large sports bar chain with good food and attractive servers is hardly new. Tilted Kilt does a good and respectable job of providing a fun, celtic themed place to watch sports and eat above average pub food. It's the last part that surprised me the most. I didn't hold me breath, but I received a very tasty buffalo chicken wrap. The fries were crispy and flavorful, and the handful of wings I tasted were also worth ordering. 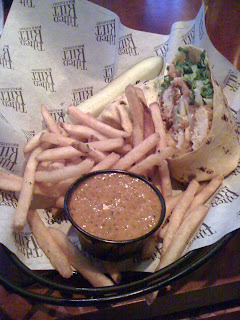 Besides having a large portion of white-meat and lettuce, the Tilted Kilt spicy buffalo sauce was different and good because it had a balsamic vinegar flavor in addition to the standard buffalo spice. Though most parents wouldn't want their daughter working at a Tilted Kilt, I can't complain about the quality of the food, drink or the number of TVs. The celtic theme also adds diversity from other sports bars. If you need a change of pace from Buffalo Wild Wings (or Hooters), I recommend looking up the nearest Tilted Kilt. With Cinco de Mayo just around the corner, the new Dos Diablos bar could be your perfect spot to celebrate. A Cinco de Mayo favorite that I would have to try is the Not so Holy Guacamole. It's made with fresh jalapeño, cilantro, and the Haas avocados are hand mashed and served in a chilled molcajete. All chicken, steak and seafood are fired over a mesquite grill, the margaritas are hand-shaken, and the portions are large. The concept is to "offer food that is fresh and familiar in a fun and relaxed environment.” Sounds good to me. Lucky for me I had lunch at Prairie Grass Cafe last week to catch up with a friend that lives in the suburbs. Unlucky for me the food wasn't very good but the company made up for it. I was surprised since I had heard good things about both "Prairie" locations. As someone else commented, I like the concept, the menu and the decor. The service was attentive and prompt, however the food didn't have a lot of flavor. I ordered a very straight forward pasta and meat sauce ("Tallgrass Beef" Penne Pasta Tossed in a Basil-Tomato-Meat Sauce with Parmesan and Bread Crumb Topping for $13.50). I love pasta with meat sauce, but this fell short of what I could make at home. I like the idea of all natural and "tallgrass beef," but it only matters if it adds taste. The presentation was interesting and I liked the bread crumb toppings, but it's hard to justify a $14 pasta dish that needed salt, pepper, garlic, oregano or any other spice. 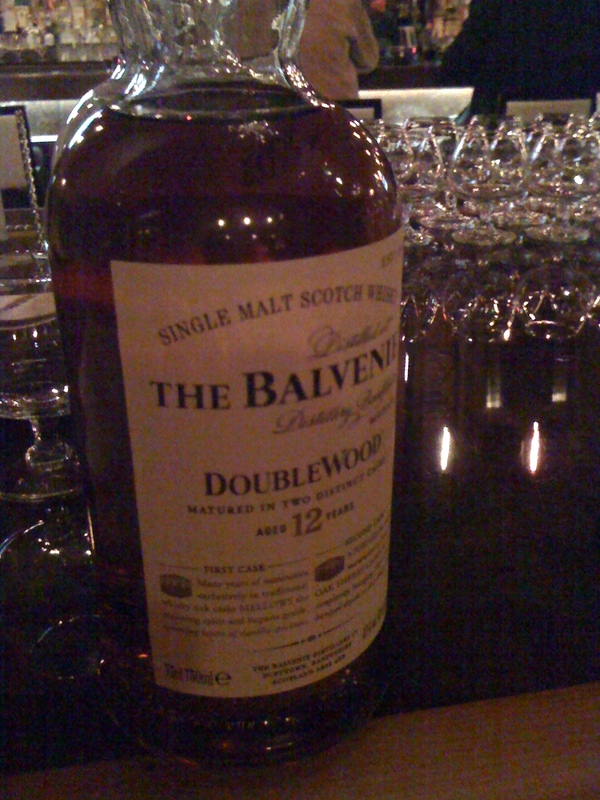 Last Wednesday I was able to get to one Whiskey Week event, a Balvenie tasting at EPIC. Overall the event was very well run in a great space. 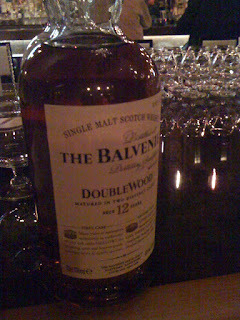 They served 3 different types of Scotch Whiskey: DoubleWood aged12 years, Single Barrel aged 15 years and a special 2009 edition Madeira Cask aged 17 years. My favorite was the Single Barrel. Maybe I should have liked the more expensive and older 17 year old, but what can I say. The tasting was very informal with representatives of Balvenie generously pouring glasses and offering knowledge and insights when prompted. The food service from Epic was fantastic. 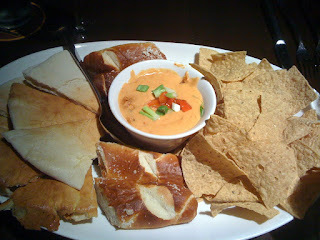 There were non-stop appetizer platters circulating with just about everything represented off of the menu. 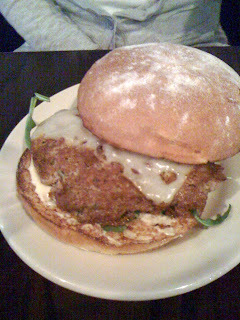 Our favorites were the beef sliders and lamb meatballs, but we were not picky whenever a server offered us something. I wish I could have taken pictures, but it's a little tricky with passed food. We had a small but appropriate sized corner of the lower bar area for a group of 20 or so people. 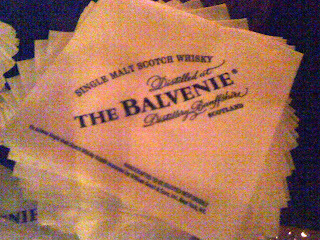 I never tried Balvenie before but I am glad I to have been introduced; the setting and food from Epic were perfect complements. Hopefully next year I'll have more time to explore other Whiskey Week events. As much as I love to try new places, sometimes it's better to stick with what you know. Last week I had lunch at DMK Burger Bar with Erica, her mother and Jim after landing from Belize, and this week I met friends at Hub 51 for 50% sushi. Both places are high on my list of favorites to dine in Chicago and my recent experiences did nothing to change that. After spending a week in Belize enjoying fresh and tasty fish, nothing says welcome home like an american burger bar. I didn't need an entire burger to myself, so Erica and I shared some mac 'n cheese (#1) and a turkey burger (#12). 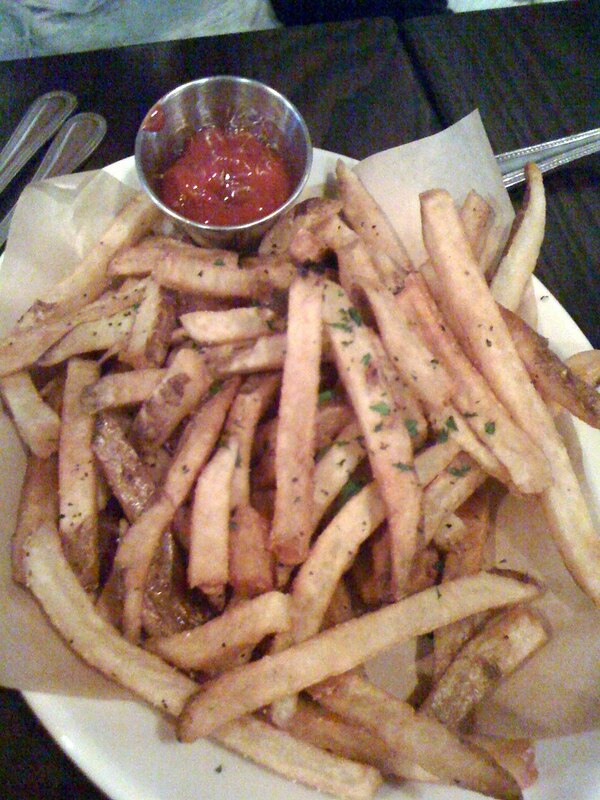 We also ordered a side of the salt and pepper fries to share with the group. As usual, we loved everything and sent back clean plates. One of my last great meals in Chicago was at Ceres' Table (my post). I'd recommend checking it out, and their new menu looks great, inspired by local ingredients. Highlights include Italian inspired favorites such as their Crab Cakes ($12), Artichokes and Mushrooms salad ($10) or the Goat Cheese Ravioli. For entrees you couldn't go wrong with the amazing flat iron steak, or try the Pork Chop ($25), Fettuccin ($17) or Day Boat Scallops ($20). Pastry Chef Leticia Zenteno was nominated for TOC's best pastry chef and earned my vote with the chocolate banana bread pudding. The pastry menu change often, but her favorites are the Strawberry-Rhubarb an Crazy Crepe. Erica has been nagging me (in a nice way) to get back to Ceres'; we just found some more reasons to make it happen. Ceres’ Table is open Monday – Thursday from 5:00pm to 10:00pm and Friday-Saturday from 5:00pm to 11:00pm and is located at 4882 North Clark Street. For more information or reservations please call 773.878.4882 or visit www.cerestable.com. If you can't wait for the Taste of Chicago this summer, grab a preview of your favorite booth for a discount. Valid today and tomorrow, download your cheat sheet here, and then enjoy. 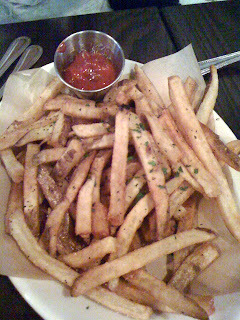 I had a disappointing experience at Sable with high expectations, especially after visiting Gilt Bar and Longman & Eagle, which are going after a similar classic cocktail list + good food theme. Jed and I stopped at the bar for a post work drink and meal to see what the fuss was all about. The major difference between Sable and the others is that they are going for the upscale look and feel. It's kind of cool, kind of put off as well. The prices on the menu also match this theme (all drinks 12-15). The cocktail menu is cool and very deep; it reads like a book with "chapters" separating sections. I enjoy sitting at the bar, but when there are actually seats at the bar. Some how they did not plan the correct number of chairs because there were sections of the bar that had none. Even after we found two unoccupied seats, our service was quite poor (and it was the same for everyone around us). There were 3 bartenders when it looked like there should have been 5. I feel bad for those guys, they were running around looking like crazy men trying to fill all the orders. Before we left another guy showed up with a very calm demeanor and seemed to get the crew somewhat back on track. But with everyone running around, we had to wait to order, wait to get food, wait to pay, etc. Sometimes I wonder why Lakeview East can't grab a new gastropub like Longman or Revolution Brewing. What about a Gilt Bar, Big Star or something from Bill Kim? I'm not complaining about my location, it just would be awesome if I could walk down the street to cool bar with great food as opposed to making a night out of visiting other neighborhoods. I like the travel, but just one spot to call home would be great. Erica and I had a solid meal at Longman, but I dare to say that it is a bar first. The cocktail and drink selection is mind blowing. 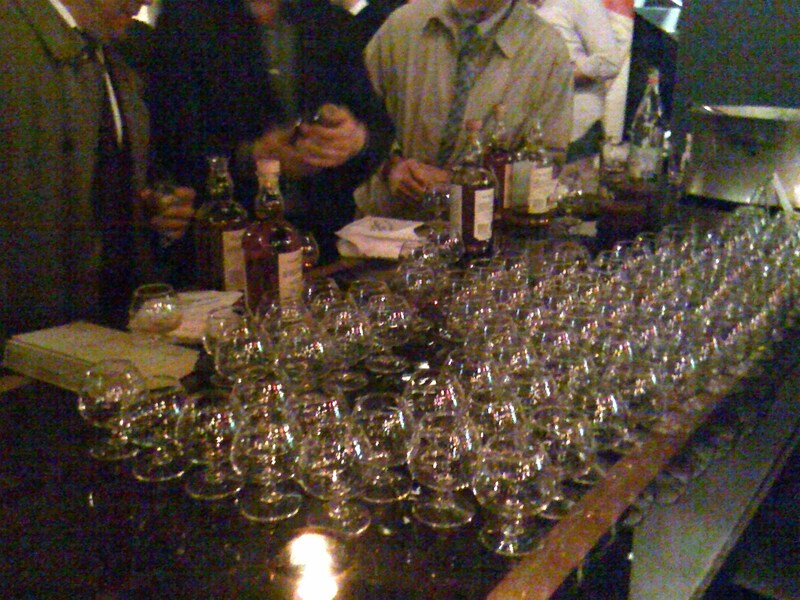 Having just returned from Kentucky Bourbon country, I appreciated the 80+ bourbons available to drink. They offer 1.25oz tastes or 2oz glasses. And it's not just bourbon, but all forms of whiskey including tasting flights for $12. Not to be outdone, the beer list is also impressive. Further supporting my view of a drink first place is the decor. Nicely dark, lots of wood, large bar and tight tables. Longman succeeds in their quest to feel like a neighborhood spot, where people know your name. A quick lunch yesterday turned out to be more of an adventure than either Erica or I planned. 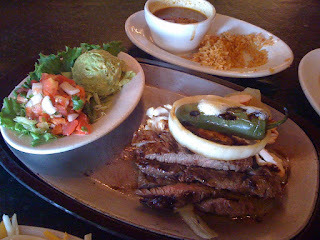 We went to order a simple fajita platter to share, quick, cheap, easy for lunch. While I know Hanger steak is very tasty, I was not expecting to eat Hair-steak. Yes, mid way through our dish I found a hair, and just any hair, but one embedded in the meat. I won't give more detail, but it was probably the worst hygienic restaurant experience to date. I realize it's not a finger, or a dead bug or anything, but still gross. I'm usually one to move along with the meal, but this wasn't cool. Our server was great and recognized the disturbing situation right away. She took the food away and brought another whole plate asap; the manger also stopped by and apologized. I took everything in stride, it wasn't my server's fault and mistakes happen. They handled the situation as well as I could ask, and even comped the entire meal (as they should). And while this was quite rare and nasty, I will conclude with acknowledging the good value of the food served, sans hair. After all, we sat and waited for a fresh dish, and continued to eat everything in front of us. the place has always struck me as a little off, and this visit confirmed that. But if you're willing to take the risk, the food is tasty: slightly greasy, tender, buttery and plenty to go around. Also, the prices might be a bit much for what they offer ($17 for fajitas). It would have been a solid meal, and even though it was free, it was a freaky dining experience. Good food, enter at your own risk. I'm usually a big fan of Satay, especially on Sunday nights when I order their combination plates (entree, soup, salad, roll). Erica and I went for a quick dinner Monday night, though it wasn't our first choice. I did not realize/remember that Penny's was not BYO. Since we were walking around with the B, we needed another spot. All said it wasn't a terrible meal, just disappointing compared to previous experiences. Even though we were two of the three customers seated, we had to wait a long time to order our food. Our tuna avocado roll was supposed to be a starter, but didn't show up until after all of the food arrived. 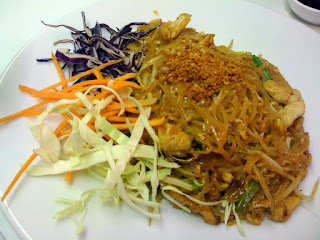 Erica's Pad Thai wasn't bad, just not as good as previous times. It's also possible the Pad Thai queen is getting more picky about good noodles. I ventured off to try something new, peanut basil noodles. 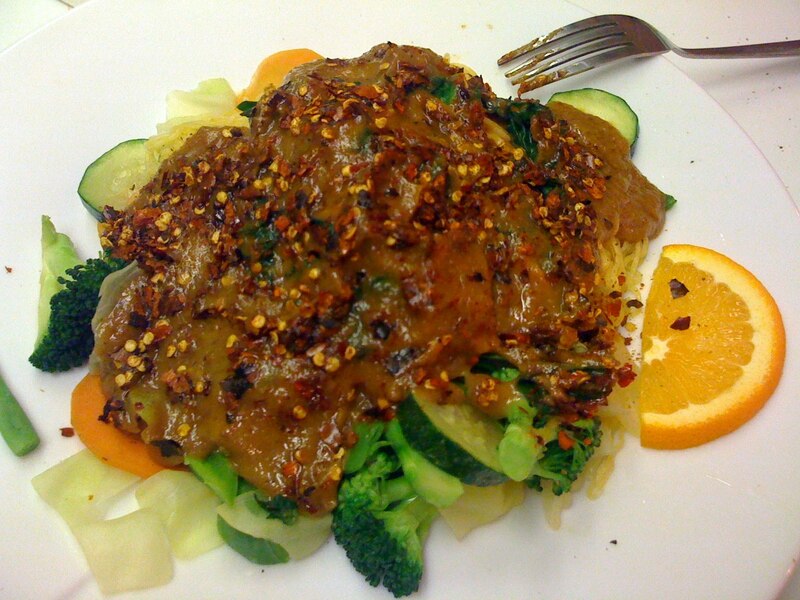 I love peanut sauce and I got plenty of it. The dish is pretty simple, egg noodles, vegetables and lots of sauce. Even though I love peanut sauce, I wasn't that impressed. Neither the noodles or veggies were flavored well; it really seemed like I could have made the dish. And then to top it all off, I didn't think the value was that great, especially compared to other shops and visits ($25 for two). I likely will order from Satay again, especially when I'm very hungry and get the combo meal. There are better asian noodle places (think Penny's next door or Fresh down the street), but sometimes you just need to mix it up. I was lead to this "institution" by a friend and alumnus of UK (Ashley Reis). After a full morning of bourbon tasting in the region, I wanted to check out the town of Lexington and the campus of UK. Erica and I stopped in for a late lunch at 4pm. The crowd wasn't much, but I can see that since it is also a full service bar, the students could find themselves here at all hours of an evening. For my meal I choose the buffalo fried chicken plate. It came with a choice of two sides and cornbread; I choose mashed potatoes and green beans. I really enjoyed my meal, where Erica only ate it for nutritional value. My buffalo sauce was tasty with just enough kick and the fried batter wasn't overwhelming. 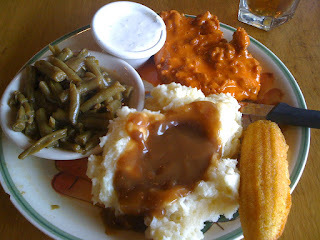 My mashed potatoes and gravy were just as I hoped for from a southern diner, but my green beans did not impress. I'm glad I got a glimpse of the local campus scene. The food and atmosphere bring me back, and there are certain advantages to the south that I did not get in Michigan. Since Ramsey's already has a devoted following, my praise is nothing new. It will be on my list next time I return. The food served at Gilt Bar is some of the tastiest in town. Everything is made fresh in house (including pasta and ice cream) with no detail too small in their strive for the best taste (playing around with frying temperatures and prep days). The detail is also found in the decor and vibe, with country music playing, low light levels on the fixtures with no cover to compliment the dark wood and leather couches. It brings you back to a time when the drinks were as important as the food, and the size of the flavors were not directly related to the size of the price. I was fortunate to dine with three lovely ladies (my sister Alyssa, girlfriend Erica and great friend Michelle), and that we all wanted to explore the Gilt Bar menu. The menu is very approachable and affordable. 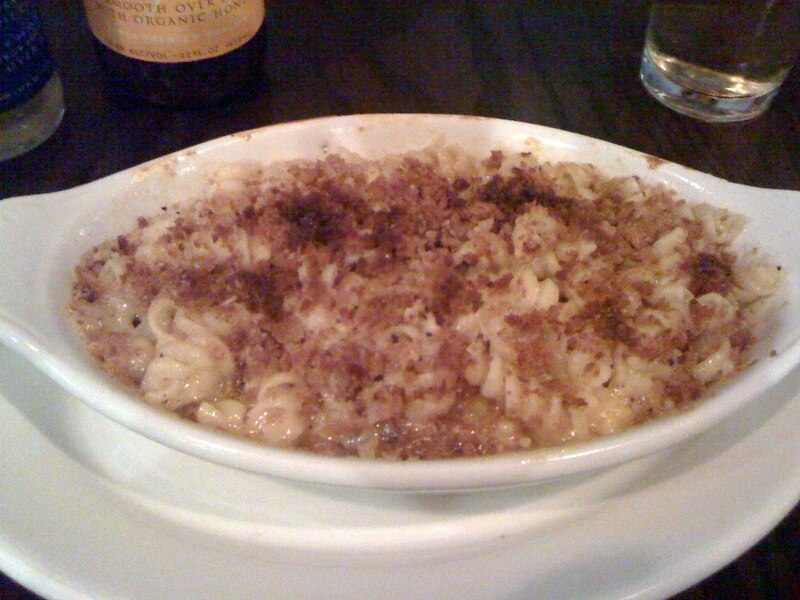 Small plates and pastas are $12 or less, main dishes under $20 and all cocktails $10. The micro-brew beer list is a nice compliment (or grab a Hoffman, aka goblet, of PBR for $2) and the wine list is unpretentious (try $4 house wine). Everything we ordered, from the cocktails, small plates, pasta dish to the dessert was delicious. The main concept is to present simple food simply and with the best flavors possible. I think Sodikoff achieved this aim with flying colors and great value; it is only a matter of time before the rest of the city finds out.